Kim Jong-un’s rhetoric and action against the US and others is framed domestically as the heroic defiance of an evil enemy. After a fairly quiet couple of months on North Korea and its self-styled madman leader, Kim Jong-un, the international community is again on high alert. On Tuesday, North Korea undertook another missile test. This time it tested an inter-continental ballistic missile, which it claims can reach anywhere in the world. On paper, North Korea represents a sizeable threat to the international community. It is a totalitarian state; it has nuclear weapons; and it is ruled by a megalomaniac leader. Even to the most self-assured deterrence theorist, North Korea must elicit some dark fears. The potential destruction of a nuclear attack and the likely repercussions is so grave that it is understandable that most are prepared to take Kim’s rhetoric and actions at face value. This is smart, in one sense, because it is arguably not worth poking a deranged animal about what he should rationally do by using international relations theory. However, in another sense, it is giving Kim exactly what he wants: fuel for propaganda. Kim’s rhetoric and actions are a carefully crafted strategy of brinkmanship, designed mostly for maintaining his domestic grip on power. The biggest challenge in his position as supreme leader – one all autocrats face – is how to maintain his authoritarian rule. Unlike leaders in democracies – where elections give a clear popular mandate to rule, and institutions have legitimacy in the eyes of the people – autocrats face an ongoing domestic conundrum of how best to cultivate legitimacy. Two strategies are commonly used: repression and propaganda. Repression (often involving terror) is an obvious tactic that leaders and elites in authoritarian countries utilise to solidify their grip on power. Weakening people’s belief that collective action can bring about positive change is an important prerequisite for authoritarian rule. Ironically, it is often when authoritarian states undertake some form of liberalisation that people are able to rise up and topple the incumbent regime. Two such examples are the French Revolution and the collapse of the Soviet Union. Propaganda is a similarly noticeable tactic that leaders and elites in authoritarian countries use to justify and explain their harsh rule. Such propaganda usually has two aims: discrediting dissidents, and blaming external actors. Under this propaganda, which becomes more potent when a state has a monopoly on the dissemination of information, domestic dissidents and opposition movements become wreckers or terrorists. Overseas adversaries become meddlers or imperialists. Can China contain the threat? Of importance to the international community right now is that, in a similar fashion to Vladimir Putin in Russia and Recep Tayyip Erdoğan in Turkey, Kim has consciously used an external adversary for domestic propaganda purposes. In this case, it is the US and its proxies – especially South Korea. To this end, Kim’s rhetoric and action against the US and others is framed domestically as the heroic defiance of an evil enemy. As the Putin example shows, standing up to a perceived evil enemy – especially a more powerful one – garners a lot of domestic support. Kim Jong-un, like his father Kim Jong-il, has been able to pursue this strategy of brinkmanship with great success, at least for domestic purposes. This is mainly because despite all the international repercussions to date – ostracism, sanctions, and threats of intervention – China has been willing to prop up North Korea. China’s interest is simple. It sees a potentially unified Korea that would place US military bases on its border as untenable. So, propping up North Korea is of clear strategic value. China probably sees Kim’s toppling as something that cannot be allowed to happen. However, it still has the best chance of managing the North Korean conundrum with the least amount of fallout. 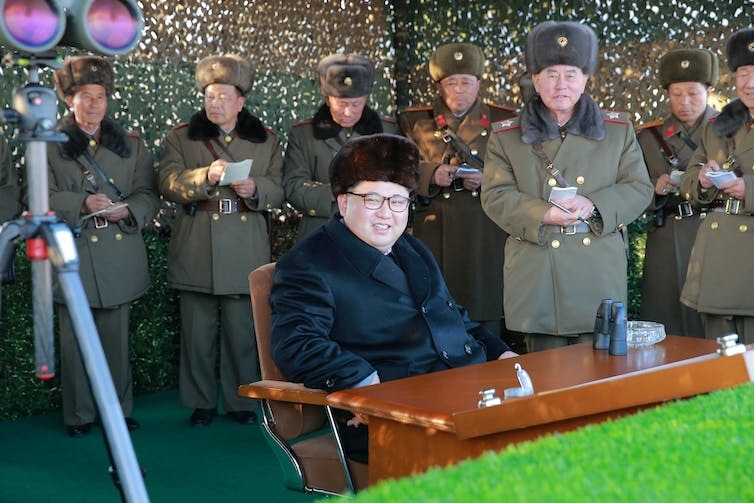 Given its own authoritarian – and previously totalitarian – structure, China probably understands Kim’s strategy of brinkmanship better than the West does. Also, China has the leverage to assuage Kim, and ensure his rhetoric and actions remain mere brinkmanship and not active policy. These facts, and the probability that China would not want any conflict between North Korea and the West, should provide confidence that – if US President Donald Trump can get out of the way – the North Korean threat is largely under control. But we definitely have not heard the last of Kim, or North Korea’s weapons program.